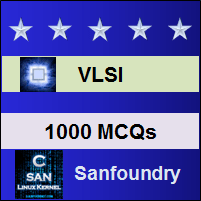 This set of VLSI Multiple Choice Questions & Answers (MCQs) focuses on “Fault Models “. 1. Which are processing faults? Explanation: Some of the real defects in chip such as processing faults are missing contact window, parasitic transistor and oxide breakdown. 2. Surface impurities occurs due to ion migration. Explanation: Some of the material defects are bulk defects and surface impurities. Bulk defects are cracks and crystal imperfection and surface impurities occurs due to ion migration. Explanation: Different types of real defects in chips are processing fault, material defects, time dependent failure and packaging fault. Time dependent failures are dielectric breakdown and electromigration. 4. Which relation is correct? Explanation: The relation fault – error – failure is correct. Error is caused by faults and failure which is a deviation of the circuit is caused by error. Explanation: For a circuit with k lines, 2k single stuck-at faults are possible and 3^k – 1 multiple stuck-at faults are possible. 6. Single stuck-at fault is technology independent. Explanation: Single stuck-at fault is technology independent. It can be applied to TTL, CMOS etc. It is also design style independent. Explanation: For circuit with n lines, n2 bridging faults are possible. Bridging fault occurs when two lines are connected when they should not be connected. It leads to wired AND or wired OR. Explanation: When input is low, both P and N transistors are conducting causing increase in quiescent current which leads to IDDQ fault. 9. Which fault causes output floating? Explanation: Transistor with stuck-open fault causes output floating. Stuck-open faults requires two vector tests. Explanation: One of the memory faults is parametric fault. Some of the parametric faults are noise margin, data retention time, power consumption, output levels etc. Explanation: In PLA, missing cross point in AND array leads to growth fault and missing cross point in OR-array leads to disapperance fault. Explanation: In PLA, extra crosspoint in AND-array leads to shrinkage or disapperance fault whereas extra crosspoint in OR-array leads to appearance fault. Explanation: The number of paths increases exponentially with number of gates. Propogation delay of the path exceeds the clock interval. Explanation: The quality of a test set is measured by its fault coverage. It gives the fraction of fault that are detected by the test set.